Fr. Thomas Zain and Patriarch John XFr. 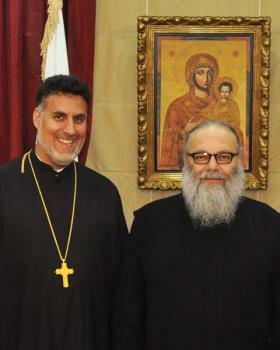 Thomas Zain of Brooklyn's St. Nicholas Cathedral, and Vicar General of the Antiochian Archdiocese, reflects in a wide-ranging audio interview on the historic significance of the enthronement  of His Eminence Metropolitan Joseph coming on December 6; the visits of His Beatitude John X, Patriarch of Antioch and All the East, and metropolitans and representatives from across the worldwide Antiochian Church; the process that has unfolded since the repose of His Eminence Metropolitan Philip  of blessed memory; specific plans for the weekend; and more.